From Glasgow we’re driving to the small city of Lincoln in England, but we’ll take a short detour. I once asked several English couples where they would choose to live in England if they had their choice. The consensus was “The Lake District”, and we’re passing close to it. For you poetry buffs, this is William Wordsworth’s stomping grounds (as well as Samuel Coleridge and Robert Southey). It comprises an area of only 30 miles x 30 miles, and we visited just the less-touristy northern part around Keswick, avoiding Wordsworth and Beatrix Potter sights (although we’re Wordsworth fans). As you’ll see, this pristine area juxtaposes a lush green countryside with treeless hills reminiscent of the Scottish highlands – quite a fascinating mix! However, getting that lush green comes at a cost; rain, mixed with occasional “bright spots”. Alas, the pictures below should show brilliant colors (it was fall when we were there), but “gloom” and “brilliant” don’t coexist easily. Still, there were occasional bright spots like that shown above – which, by the way, was absolutely spectacular, in spite of the gloom! Near Keswick is the Castlerigg Stone Circle, built in the Neolithic period around 3200 BC. A little quick math says this circle is 5,000 years old, which is going back aways. It’s one of the earliest stone circles in Britain and possibly in Europe. From that aerial picture, it contains an unusual rectangular inclusion, called the “sanctuary”. You may recall our previous encounters with similar stone circles in Scotland and Ireland (Isle of Harris and Southwest Ireland Tour and Traditional Irish Music I). All these stone circles were built on a relatively high hill or ridges, with a view of the mountains in the distance – presumably in order to align the stones with mountain landmarks and the rising or setting sun at particular times of the year. Since the heaviest stone is estimated to weigh 16 tons, hauling that sucker uphill must have been a chore, not to mention positioning it (Oops! Nope. Another foot to the right, please). This Castlerigg circle is in a beautiful setting, as you can see below. the stones served as a celestial calendar for ritual celebrations. The sanctuary points to where the sun rises on May 1, the ancient (northern hemisphere) spring festival. Some stones in the circle have been aligned with the midwinter sunrise and various lunar positions. As in all these (thousands of!) stone circles, their true function is unknown. Some archeologists link this circle with the nearby Neolithic stone axe industry (ah, early Capitalism! ); the circle may have been a meeting place where stone axes were traded or exchanged. Ritually deposited stone axes have been found all over Britain, suggesting that their use was more than functional (is that the original “bury the hatchet”?). also not short. The view, however, is worth it. Now we just have to hike out of here in failing light! Our reward as we stumble out is the view of cozy lights from the windows of the hillside farms. Our B&B is in the Newlands Valley just west of Derwentwater Lake, and the vista that greets us is a nice “G’morning, isn’t this gorgeous!”, even though that “bright spot” in the picture isn’t shining on us. Today we’re driving a loop that goes through a lot of Lake District scenery: Newlands Valley, Buttermere Village, the Honister Pass, Borrowdale, and Derwentwater Lake. We’re heading west, and our two-lane road quickly becomes a single lane, as shown in the first picture below (although the road does have turnouts). The subsequent pictures show picture-book idyllic scenery. Then it’s up to Newlands Pass, going up treeless mountains as shown in the first picture below. At the top is a nice waterfall! And then there’s a colorful descent down to the hamlet of Buttermere and its scenic lake. but it’s nicely shown in the next one. The beauty of the long lake is offset by strange denizens – some of the ugliest, shaggiest sheep we’ve ever seen, a breed called Swaledale. The poor things look like they’ve been assembled from a variety of leftover animal parts. As we travel further we encounter another waterfall, even more beautiful than the last one! mountains! That last picture looks back at the previous waterfall. This is an awesome area! We’re now heading up to glacier-carved Honister Pass. This picture also looks back at our previous waterfall, far in the distance. The river adds a new element to this pretty area. picture below are grazing Swaledale sheep. Near the top of the pass is England’s last still-functioning slate mine, which one can tour, but we decide to press on. Going down is steep, but pretty; we have trees again. Back at the valley floor there are scattered hamlets, and the scenery is again bucolic. You remember Derwentwater Lake, seen from above during our hike yesterday (shown earlier), right? When we climbed Latrigg Peak? Well, now we’ve circled around to the lake’s southern end, at lake level. The forest is gorgeous in its fall colors, the lake is choppy and gray but still interesting, and we decide to take a short hike along its shore. Back on the road, the valley is enchantingly beautiful. In the pictures below, the green of that grass seems impossible, but it’s real. greeting the next day – another stunning “G’morning”. Alas, we must leave this magnificent Lake District. The next post will be from Lincoln; it’s not really on the tourist trail, but it does have a magnificent cathedral. You’ll see. The hill on which Bamburgh Castle sits was a defensive site for thousands of years, taken and lost, damaged and rebuilt over the course of many centuries. The Britons had an early fort here which was captured by the Anglo-Saxons in 547. Later, in 607, King Aethelfrith expanded this region to create Northumbria and in 615 renamed the fort Bebbanburgh after his wife, Bebba. His death in 634 was followed by the usual fight over succession, and his son Oswald fled to the Scottish isle Iona for safety. 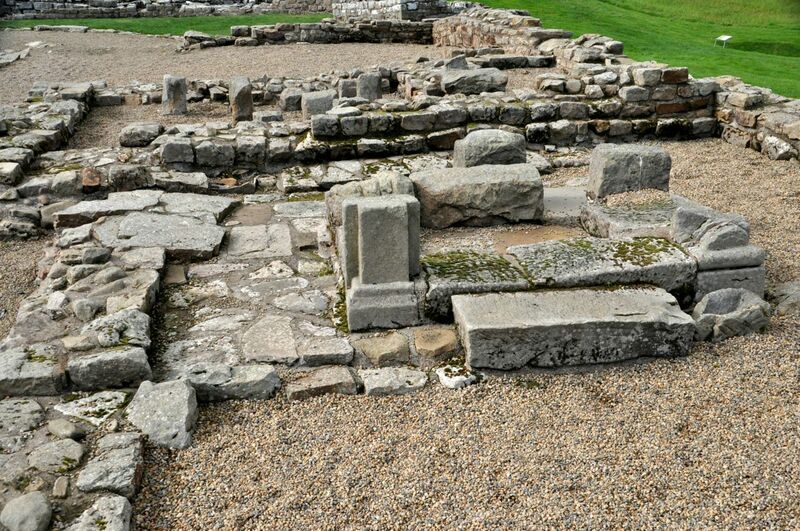 This was the home of the monastery that introduced Christianity to the Picts. When Oswald returned in 635 to oust the Welsh pretender and claim his throne, he brought a monk named Aidan with him from Iona. 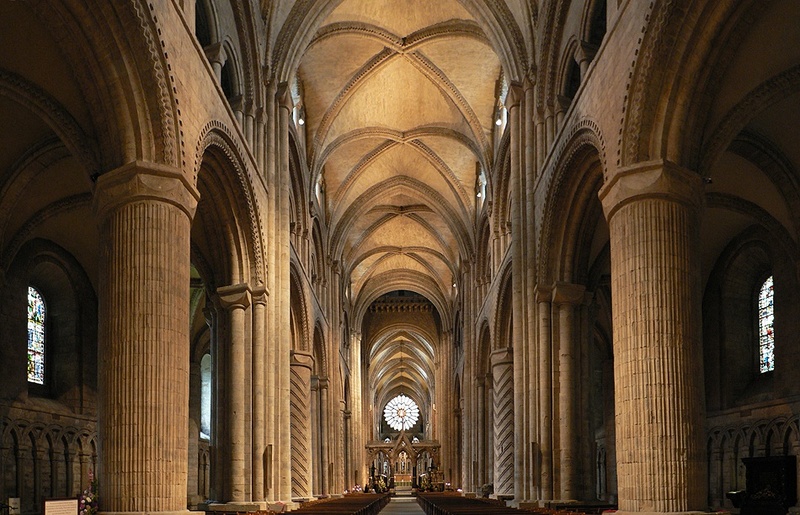 Aidan established Christianity’s tenuous toehold in England at nearby Lindisfarne (see previous post “Durham and its Norman Cathedral“, February 6, 2015). Rival kingdoms continued to contest the region for several centuries, until Bebbanburgh was left in ruins by the Vikings in 993. 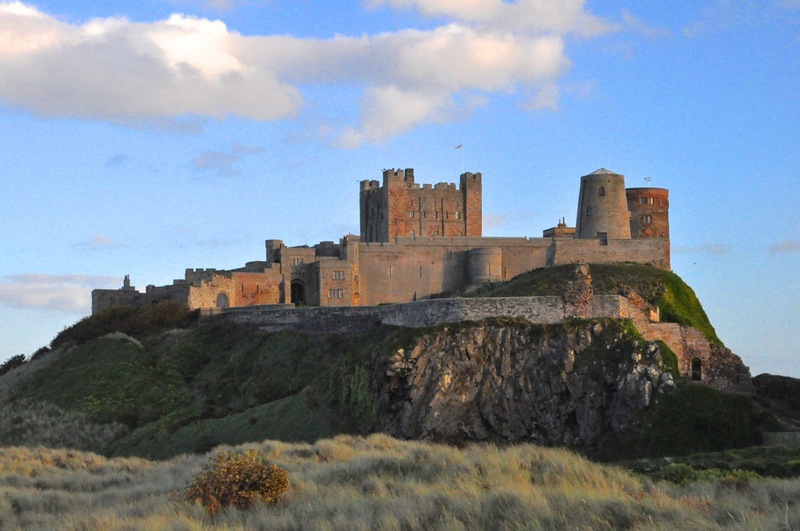 The conquering Normans built a new castle on the site, which forms the core of today’s Bamburgh Castle. That square keep in the middle of the picture was built in 1164. 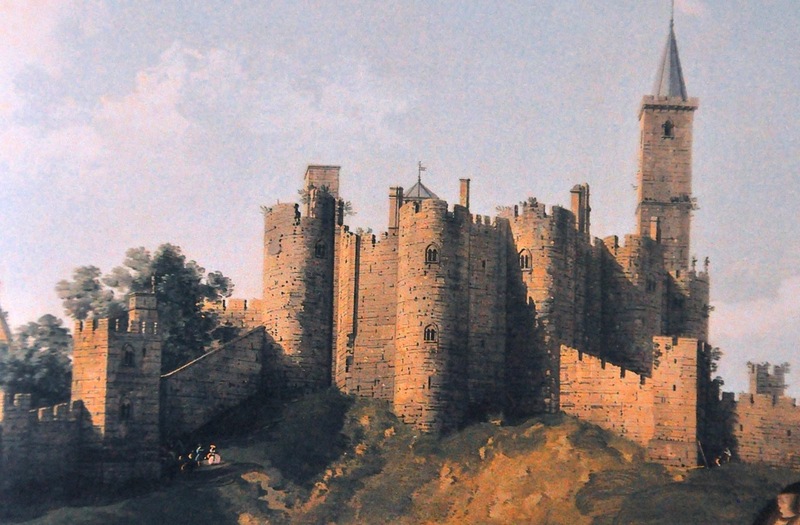 In 1464, during the War of the Roses, Bamburgh endured a 9-month siege; artillery was brought in to the attack, and the castle (but not the sturdy keep) was heavily damaged. 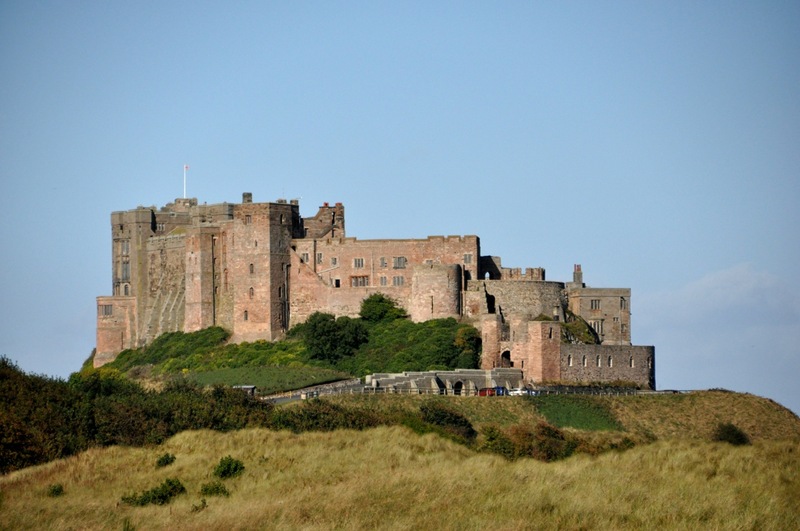 Bamburgh gained the dubious honor of being the first castle in England to be defeated by cannon fire. During the 18th and 19th centuries the castle was restored by various owners. The restoration was finally completed by the wealthy Victorian industrialist William Armstrong in the 1890’s. once through the first gate, attackers would have had an uphill climb between high inner and outer walls to reach a second gatehouse and those walls would have been well-defended. Attackers who managed to make it through the second gate would have found themselves in yet another uphill walled corridor, both trapped and exposed. Run fast and duck a lot! A model of the castle is shown below. picture is Lindisfarne Castle, seen from Bamburgh Castle’s battlements. Lindisfarne, now called Holy Island, is that close. small storage rooms we enter the impressive King’s Hall. Take a look at that fantastic ceiling – it’s teak! Wow! Straight ahead is the Cross Hall. This was the site of the (targeted) owner’s apartments that were destroyed in 1464. From there we wander halls and and can only peek at the stairs that lead to the current owner’s private rooms. It’s quite a refined castle, really. Cold and drafty it is not. There is an armory with interesting armor and weapons, including a crossbow. ceilings are the typical barrel vaults used by the Normans. In addition to the fireplace, the room has a well, the oldest of 3 on the grounds: “There is on the west and highest point of this citadel a well, excavated with extraordinary labor, sweet to drink and very pure to the sight” – A History of the Kings of England, Simeon of Durham, AD 774. The well is 6 feet in diameter and 130 feet deep, through solid stone. stone chair or throne from around 800 AD. Since Bamburgh was a royal site, there is a chance it was part of a royal throne, a reconstruction of which is outside the keep. impressive, isn’t it? It too has a cinematic history, having been used in films such as Ivanhoe (1952), El Cid (1961), Mary, Queen of Scots (1971), and Elizabeth (1998). major fortress along the Anglo-Scottish border. The garrison in 1314 consisted of 3 knights, 38 fully armed soldiers and 40 mounted troups. The castle balanced military requirements with the family’s residential needs, and became the template for castle renovations in the 1300’s. The castle became a focal point in the War of the Roses (1455 – 1487), changing hands 5 times between 1462 and 1464, but it ultimately ended up back in Percy hands. However, the 7th Earl of Northumberland, Thomas Percy, loyal to the Catholic Church, was a leader in an unsuccessful effort to restore Mary Queen of Scots to the throne and was beheaded for treason in 1572. After his death, the castle was uninhabited and fell into decay; the Italian Canaletto’s romantic view of the castle, painted in 1752, barely masks its forlorn state of crumbling, cracked, and plant-infested walls. Fortunately, in 1750 a descendant of the Percys, Elizabeth Seymour, and her husband the Duke of Northumberland inherited the castle and decided to make it their principal country seat. Famous architects including Robert Adam whom we met earlier (“Harewood mansion, near Leeds”, Dec 11, 2014) were hired to transform a medieval castle into a modern (Gothic) palace. Parts were torn down and rebuilt, a chapel was added, and the interior of the keep was completely transformed (state rooms, grand staircase, etc. were added). Finally, in the 1850’s the Fourth Duke (Algernon) replaced many of the Gothic decorations with the finest Victorian vision of an opulent Italianate style, and this is the castle one sees today. Before we show off this castle, let us mention that there is recent history here too, of the cinema type. The Castle is picturesque, and has been the site of many movies, including Becket (Peter O’Toole, Richard Burton), Mary Queen of Scots (Vanessa Redgrave), Ivanhoe (Anthony Andrews, Sam Neill), Robin Hood- Prince of Thieves (Kevin Costner), Elizabeth (Cate Blanchett, Joeseh Finnes), Harry Potter and the Philosopher’s Stone (you know the actors) and Harry Potter and the Chamber of Secrets. gate! That gate ahead of you (with imposing towers) goes directly into the keep. And if you turned to your right, you would be looking at the inner bailey – quite a large area for stables, growing crops, etc. Does it look familiar? It’s Harry Potter’s quidditch field, of course. outer bailey. In that last picture above, we’ve walked across the outer bailey and are looking back at the keep, with the Middle Gateway on the far right. drawbridge, and outer tower and gate, which lead to … another gate! It would have been a deadly arrangement. Invaders who managed to make it through the first gate would have entered a narrow, high-walled, roofless area with another barred gate ahead, and no place to hide. The defenders on the walkways above, protected by the tower walls, would have had easy targets. You might recognize this gate as the one that the Weasley family car flies through in the Harry Potter series. The outer bailey is also where Ron and Harry fly the family car into the Whomping Willow tree, which was situated to the left of this picture. archway from the early 1100’s decorated with Norman chevrons. It is picturesque! 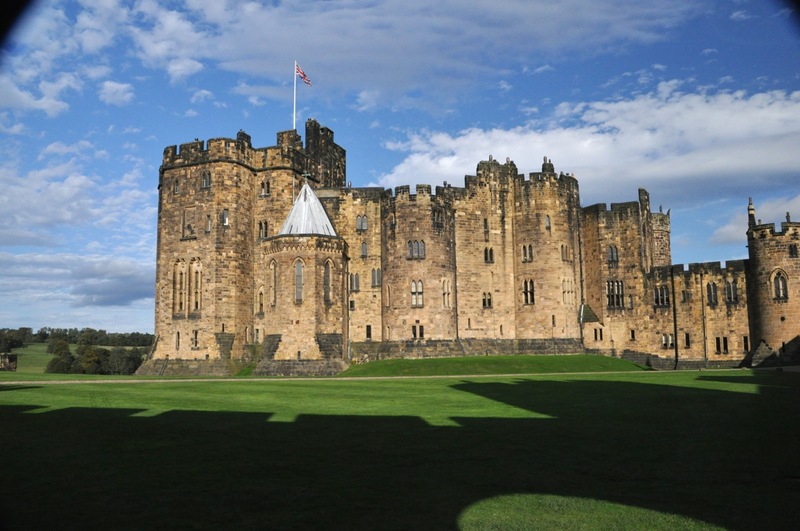 Alnwick Castle is only open to the public in the summer – and then, only some of the rooms in the keep’s palace can be seen. 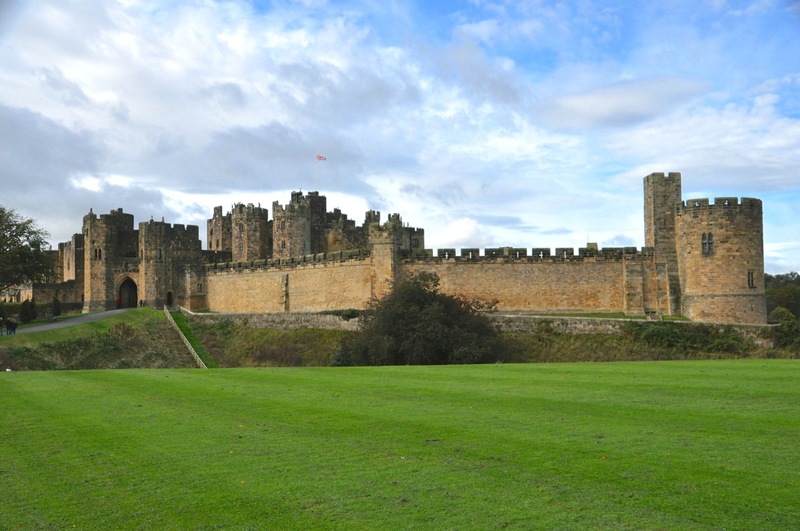 Like the Harewood estate in the earlier blog noted above (“Harewood mansion, near Leeds”), Alnwick Castle is a privately-owned home – in this case, home of the current Duke of Northumberland. There are a bunch of public tours offered at the castle, but we only had time to take 2, one being this palace tour, the other the Harry Potter tour (of course). The palace was renovated in Italianate style, and although the official website says a large amount of Robert Adam’s Gothic work survives, none of it is in the rooms shown to the public. A bigger “alas” is that no photos were allowed! So we bought their Alnwick Castle book and took pictures from it, just to give you an idea (once again) of how the English aristocracy lived – and lives. Below are some rooms and details …. a pair …) made in 1683 for Louis XIV’s Versailles. I wish I could have taken pictures! That’s a picture from the book. Those panels you see? The designs are made from inlaid semi-precious stones. They are jaw-droppingly spectacular. We should also mention the (plentiful) paintings by Van Dyck, Turner, and a slew of incredibly famous Italians, examples below. Museum curators would drool. representative to the coronation of Charles X in France in 1825. It was last used for the wedding of Lady Melissa Percy, youngest daughter of the current Duke of Northumberland, in 2013. Gosh, why didn’t we think of using something like that, instead of Ginger arriving for our wedding in the family car? Yup, if you’ve got it, flaunt it. designers in England and Europe were hired, a charitable trust was created, and the Duke and Duchess donated a great deal of money and the 42 acres on which the gardens sit. We visited in September. The hillside of ornamental cherry trees was not in bloom, but the meandering garden still had some flowers and a slightly bombastic charm. The ornamental section was ordinary but nice. Pretty birds had the run of the place. 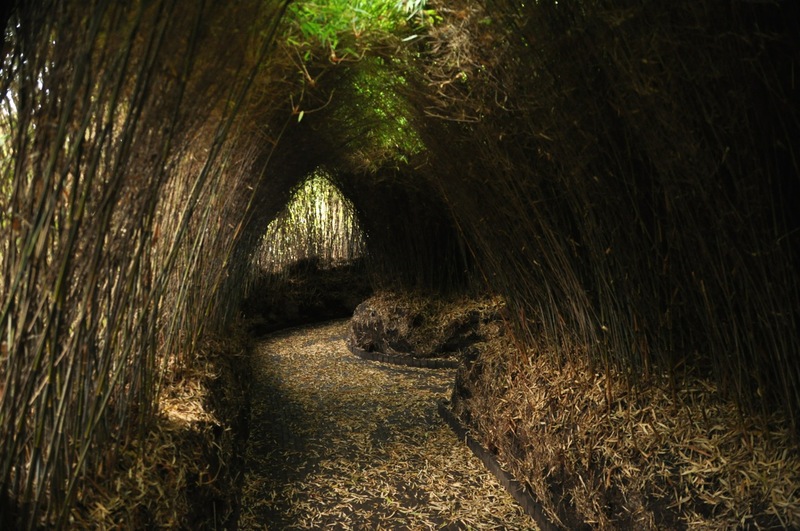 What really impressed us was the garden’s bamboo maze. We did indeed get lost in it, in spite of there being several exits. On the grounds of the Garden, off to the side, is a beguiling and intriguing place to explore. High up in the treetops, amid wobbly rope bridges and wooden walkways, is an enormous treehouse with a small shopping area that included a fancy restaurant and a funky laid-back bar. It was a delightful way to end a very long day! The Roman Empire extended nearly to Scotland. The Romans arrived in southern England in AD 43 and set about subduing the population; it did not go easily! Revolts were common. Originally the Romans provided infrastructure and protection (therefore promoting stability and a better economy, thereby allowing higher taxes), but otherwise they worked through treaties with the tribes of England and allowed local government rule (client state allies). Local fiefdoms could thus hate each other and the Romans, with ensuing wars and revolts, principally by the Brigantes in northern England but also local tribes such as one that destroyed Roman cities like London and St Albans. In the AD 70’s the Romans had had enough of the Brigantes and client states, and conquered instead, occupying the land and establishing Roman rule by Emperors. They drove deep into the north (today’s Scottish Highlands) and consolidated their grip on northern England. Continuing battles in the north caused a withdrawal from what is now Scotland, and around AD100 a frontier zone of forts and watchtowers linked by good roads was built to hold the native tribes in northern England in check. However, fierce fighting continued (some forts were burned down). In AD 122 Emperor Hadrian arrived shortly after some hard fighting. Hadrian had a “defense before expansion” philosophy. Realizing that the cost of conquering Scotland would far exceed the economic gains (“It’s the economy, stupid”), he decided to build “Hadrian’s Wall”, an admission of the limits of Roman power. It would prevent the southward movement (raids) of the unconquered north, and allow the Romans to develop the economic potential and prosperity in the growing Romanized southern provinces. gate, with turrets on either side, 80 castles in total. During construction the plan changed, and some castles became full-fledged forts. 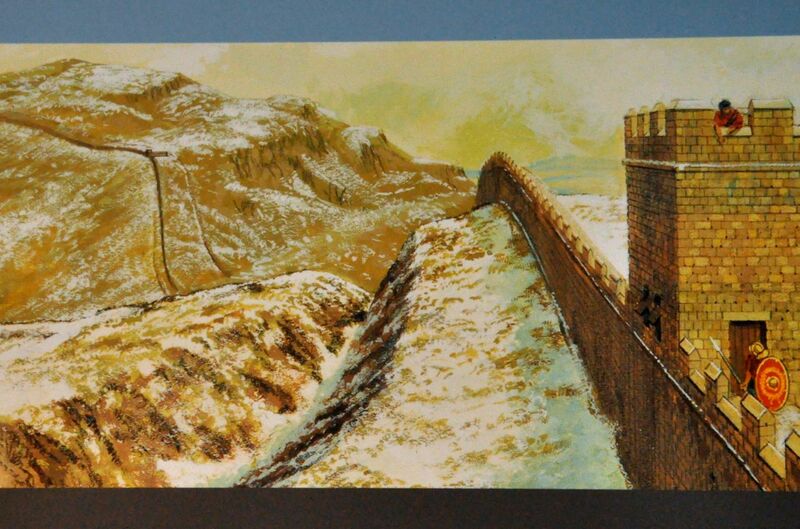 For perspective, the (longer, bigger) Great Wall of China of the Ming Dynasty was built 12oo years later…. Today, Hadrian’s Wall is really “Hadrian’s Shelf”; what’s left is about 3 feet wide and 3-6 feet high, when it doesn’t disappear into a hill. It’s still pretty cool, but really there is so much more to see than just a wall. There are a dozen or so Roman forts along or near this wall, ongoing archeological digs, and some pretty amazing artifacts in museums. The remains of the forts themselves are a fascinating glimpse into a 2nd-century soldier’s life. We’ll look at two of them. Let’s start with the Housesteads (originally Vercovicium) Roman Fort, which was a fort attached directly to the wall. few feet high, they’re enough to provide the “you are there” effect. The commanding overview of the countryside is also pretty impressive, as is the steep hill that the soldiers had to walk up and down every day. Let us give you a quick tour of some of the sites. As you entered the East Gate of the fort, you would have passed this giant Victory statue, symbolizing success in battle and protection against death (and a foot on the world). 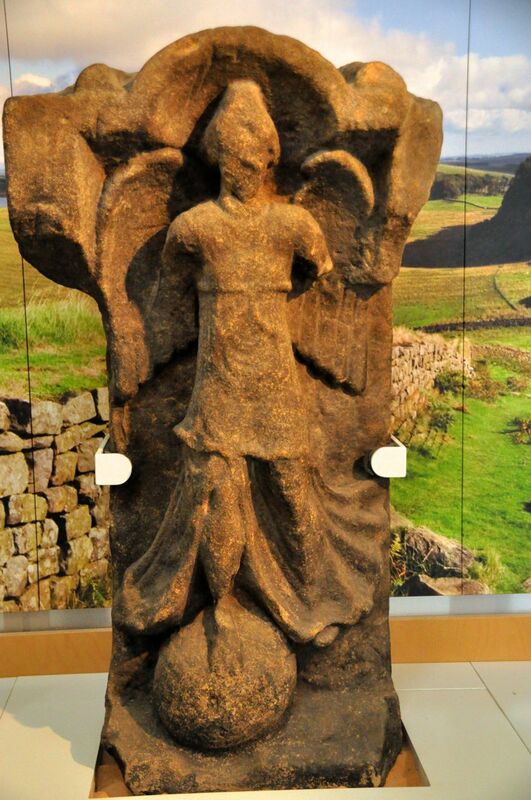 Four such statues were recovered from Housesteads. Within the fort, we’ll start with the soldier’s quarters – the remaining ruins and an artist’s reconstruction. was a long, low building that accommodated 80 men, an army unit called a “century”, in 10 compartments – plus a larger apartment for the centurion in command. Usually each compartment was divided into a rear room for sleeping and a front room for weapons and kit. As you can see, space was at a premium. A roof extended over the front of the building, supported on stone columns, to provide a dry covered area. usually found only in larger fortresses. Even more rare, there is another hospital on Hadrian’s Wall at the fort at Wallsend – perhaps they were required in a region that saw a lot of action. The hospital here was built around a courtyard (in the foreground in the left picture above) where a covered walkway provided access to the rooms. A large room along the top side (the stone floor in the left picture) may have been a surgery. The smaller rooms were for the sick or wounded, and there was a latrine. And when all else failed, a soldier could appeal to the gods for aid – in the Housesteads museum there is a votive foot that would have been offered to the gods in exchange for a cure for a foot ailment. lowest downhill corner of the fort. Pretty fascinating! With 800 men in the fort, good hygiene was important. The latrine had a deep sewer, originally covered with a raised wooden bench with holes. The sewer was flushed by rainwater in drains brought from all over the fort, and went out via a culvert under the fort wall. In dry spells, flushing was with rainwater collected from the roofs of nearby buildings and stored in stone tanks (two are still there). Within the latrine, the central platform had a stone channel along which water flowed for washing. The two stone basins were used when water supply was restricted. vents, an overhanging roof to keep rain away from walls, and raised floors to allow the circulation of air and to stop moisture and rodents. This granary was on the highest and driest region of the fort; originally it was a single building, possibly 2 stories high. It was later modified into two buildings. 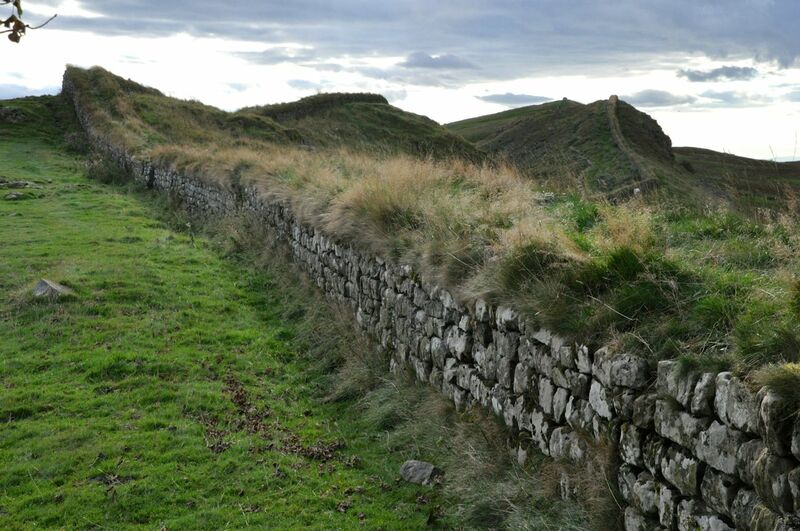 We’ll end our Housestead’s tour with a walk along Hadrian’s Wall, and the view it presented into the scary north. Vindolanda was a bigger fort than Housesteads, housing at least 1000 soldiers and likely many more at various points in its history. Vindolanda guarded the Stanegate, a major Roman road, and was an important fort (and village) for 40 years before construction started on Hadrian’s Wall. The fort itself is only about 2 miles away from the Homesteads fort, and less than a mile south of the Wall. So why would Housesteads have been built at all, with Vindolanda so close? The answer is likely due to the more complicated history of Vindolanda, which was occupied for 325 years – but not occupied continuously. 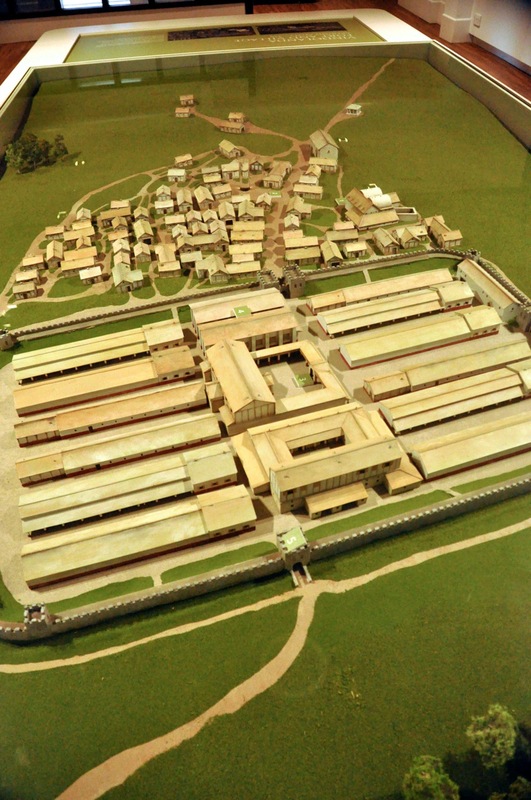 Vindolanda is the site of at least 9 forts, built (and demolished) one on top of the other. The first, built in 85 AD, was a timber fort, as were the next 4. After Housesteads was built, many of Vindolanda’s soldiers were moved further north to the Antonine Wall (oh, you didn’t know there was a Roman wall built north of Hadrian’s? We’ll come across that in a later post). To cope with a diminished number of soldiers, a smaller stone fort was built at Vindolanda. Subsequently that was destroyed and 3 more, usually larger, stone forts were built. Finally Vindolanda was abandoned in AD 410. These ruins are generally not as impressive as Housesteads, but they’re still pretty interesting. The temple to the left is an extremely rare find. It was built inside the fort walls around 220 AD; the shrine to the god is located in the center of the main room. The temple was dedicated to the god Jupiter Dolichenus, an ancient weather god widely adopted by the Roman Army. The building was eventually destroyed around 370 AD when paganism was being replaced by Christianity. money for the soldier’s pay, held the regimental banners and honors, extra weapons, etc., and was the center where all the records and administration for most aspects of military life took place. structures and would have held grain, beer, sides of ham and smoked pig, hay for horses, and spare military kit. 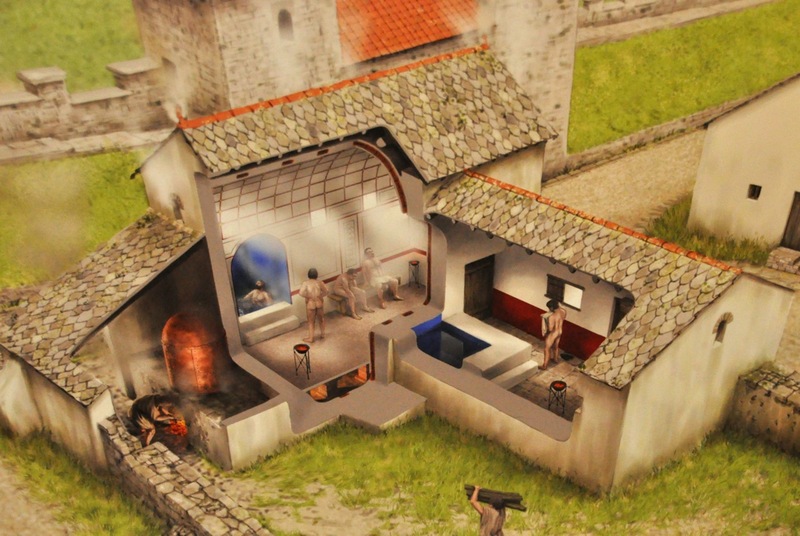 They would have held enough food to supply Vindolanda from harvest to harvest. functions where soldiers (and their families) could work out, relax, gamble, gossip, etc. It also provided access to a public toilet. all. The main draw of Vindolanda is not the ruins as much as the museum. This is still a working archeological site, of major importance (and you can talk to the people out on the site cleaning things freshly dug up). I mentioned there were (at least) 9 forts here, one on top of the other. Two things make this site exceptional. One, the Romans sealed the foundations from each previous fort and built fresh; the 9 forts go down nearly 20 feet deep from what you see here, each isolated from the others. Two, the water-logged site is very anaerobic, preserving thousands of items that normally do not survive, like clothing, shoes, and wooden writing tablets. 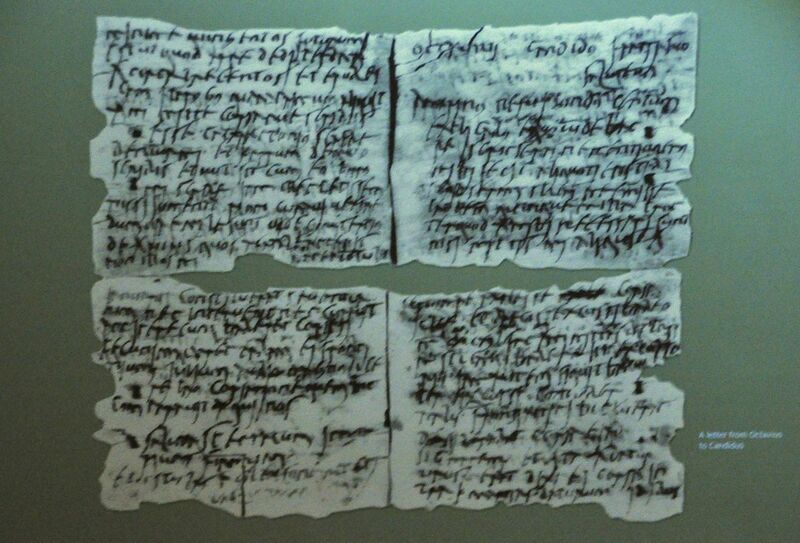 The site has produced the largest collection of Roman Empire leather items, but it is particularly famous for the preservation of wooden writing tablets that provide a singular look at Roman life on the frontier. We’ll share views of some items from the museum! We’ll start with leather shoes. Romans could choose from a range of footwear. A common type was the carbatina – it was cut from a single piece of leather, had scallop-shaped holes along the upper edge and was tied with a single lace criss-crossing the foot. earrings, combs (including one still in its leather case), and hairpins (or dress fasteners). The silver hairpin with a hand holding a chain is particularly interesting – at the end is a small mirror with hook that attached to the wearer’s hair. hammers and crowbars that look pretty familiar! The (new) sheep shears we saw in New Zealand last year looked just like those from 200 AD. The museum had a lot of other stuff, like stone carvings; you’re on the frontier, in a fort, and you have art?? And, of course, there were coins and armor and pottery. Enough for now! Hope you enjoyed this look at the Roman Empire. 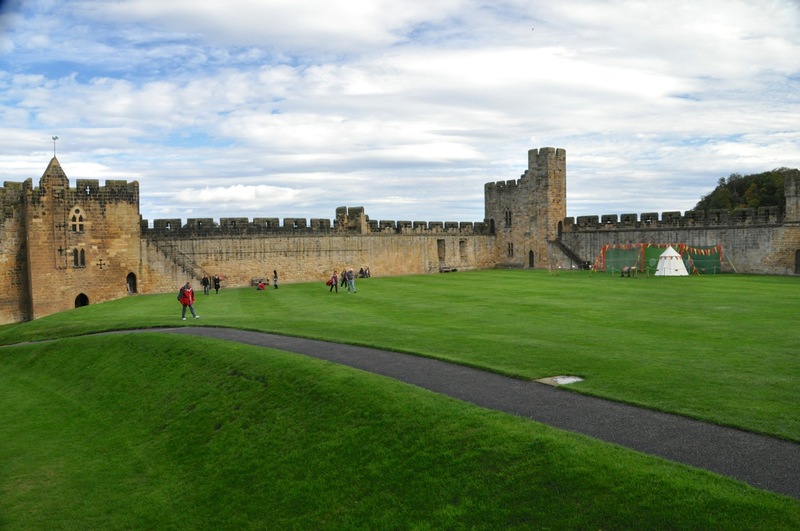 Next post, the Alnwick Castle, site for Harry Potter’s Quidditch match. Durham has England’s 3rd-oldest university, a medieval atmosphere, and, reputedly, England’s best Norman (Romanesque) cathedral. The cathedral is spectacular indeed. We passed through Durham on our way north, so our visit was very brief; we would love to go back again. It’s a charming little place, built along a tight curve of the river that has protected it on 3 sides for hundreds of years; it also occupies some seriously steep hills. width on the inside. Pretty quaint. On the left is an example of a town building that is not on the Market Square. 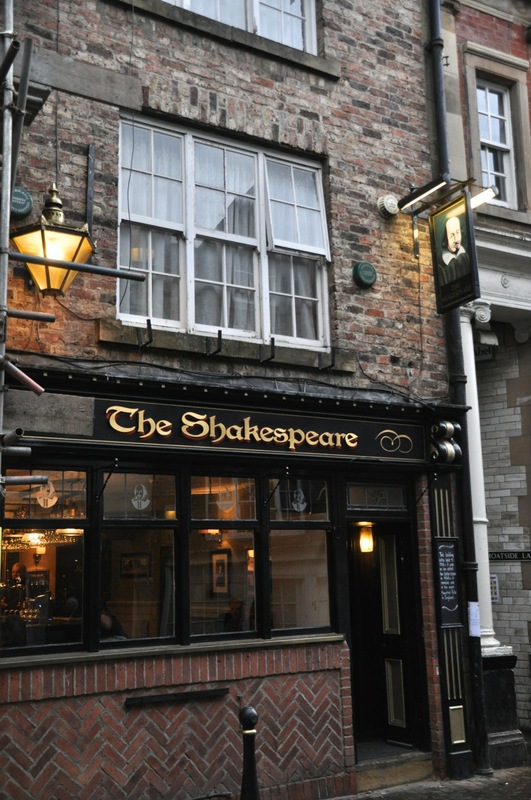 The building, which houses The Shakespeare Pub, dates back to 1109. It was an inn (the Ostler & Groom) in 1468. Obviously it has seen a lot of modernization, but I love the preserved lineage of the buildings in Europe! The connection with a past is palpable. Now off to the Cathedral! It was built to house the bones of the revered St. Cuthbert, who was instrumental in returning Christianity to the UK after it had drifted back to paganism. St. Cuthbert was bishop of the Lindisfarne (now Holy Island) monastery in the mid 600’s, and was buried there. Eleven years later his body was exhumed (building project) and found to be perfectly and miraculously preserved, enhancing his fame and attracting even more pilgrims to the site. When the Lindisfarne monks fled the island in 875 to escape Viking raids, they carried his body and the famous illustrated Lindisfarne Gospels with them. After 120 years of roaming, the monks finally settled in Durham and built the “White Church” to house St. Cuthbert’s relics. A hundred years later construction began on a monastic Cathedral to replace the White Church; and what a Cathedral it is!! A renowned masterpiece of Romanesque architecture, it is the only cathedral in England to retain almost all of its Norman craftsmanship, and one of only a few preserving the unity of its original design. The nave, choir and transepts are all Norman; the nave contains what is thought to be the world’s first structural pointed arch. There have been some updates; the Galilee Chapel is late Norman 11oo’s; the chapel at the opposite end is 1200’s in the Gothic style. The western towers are from the 1100’s and 1200’s, and the central tower is from the 1400’s with Gothic detailing. Picky details, it’s all pretty darn old! You might have noticed that it’s also immense – nearly 500 feet in length. Unfortunately, my pictures couldn’t capture its magnificence. Before we head inside, take a look at pictures of the cloister, below. While it was begun at the same time as the Cathedral, much work was done on it from the 1400’s on. The true beauty of the Cathedral is inside, but, alas, photography was forbidden. I found some pictures on the internet that I will share here. The nave is particularly striking; built in only 40 years (started 1093), it is harmoniously textbook Norman. You may have noticed that other aspects of the Cathedral, such as the transept windows shown on the exterior pictures, are proto-Gothic – built by French masons and architects familiar with Europe’s latest innovations. The Cathedral is just amazingly beautiful, as you’ll see in the borrowed pictures below. 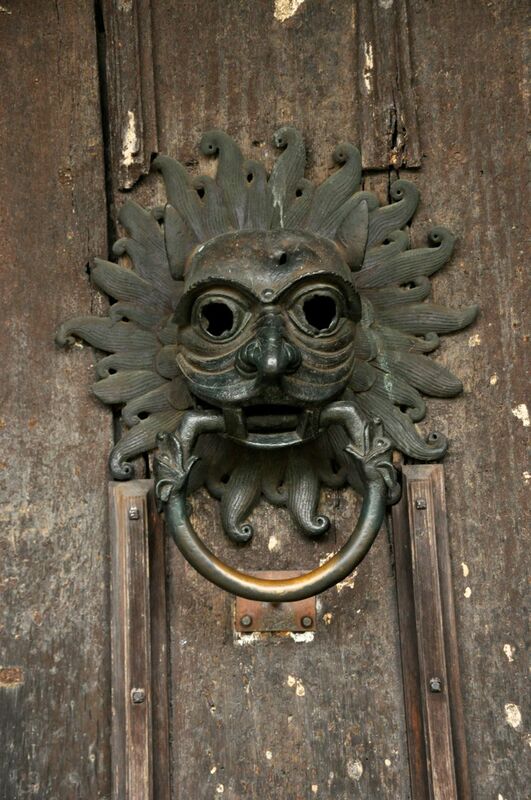 One interesting aspect of the Cathedral’s history is the big lion-faced knocker on its door. In the Middle Ages the Cathedral provided a refuge for fugitives. Anyone who was accused of a serious crime could claim sanctuary by knocking on this door. Fugitives were given 37 days to organize their affairs and decide whether to stand trial or (safely) leave the country by the nearest port. Next stop – Hadrian’s Wall. Getting closer to Scotland! We’ll finish describing the fascinating city of York with a look at their two very different museums, the Yorkshire Museum (York’s history) and the York Castle Museum (re-creation of home life in more Victorian times). This post is a bit long, dedicated to museum go-ers; be forewarned! carried his wealth on his arm; to open the purse, it had to be removed from the arm. After the Romans left, the Angles, from northern Germany, moved into the region they called Northumbria and settled Eoforwic (York). They occupied the region from about 410 to 866. The museum has a number of wonderful artifacts from this time. Let me digress for a moment and present this interesting tidbit of life back then. 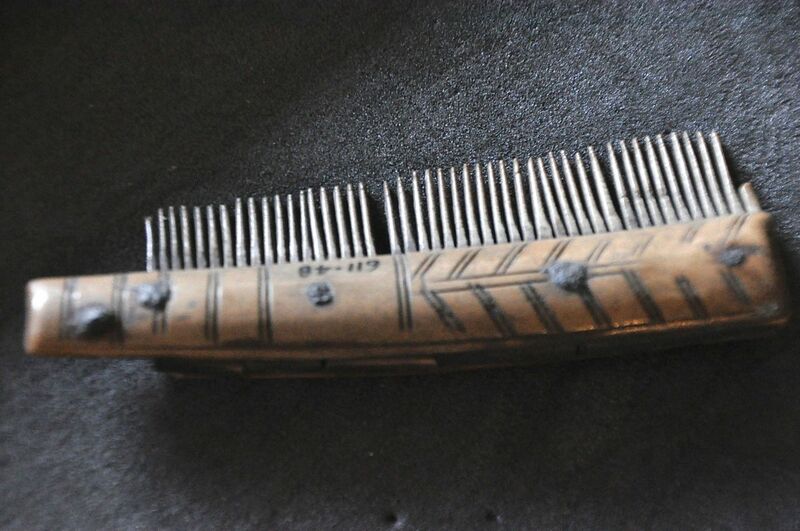 The comb to the left is from 600-700 AD, and was not used primarily to arrange hair. Rather, it’s use was to remove lice and their eggs …. In 866 the Vikings (Ivan the Boneless and his Great Heathen Army [I’m not making that up!]) conquered the region and renamed Northumbria “Danelaw”. Eoforic maintained its status as capital of the region but was renamed “Jorvik”. Shown below are several stone carvings from this period, and a reconstruction of a Viking farmstead. last two pictures show the Ormside Bowl, an Anglian ecclesiastical vessel converted in Jorvik into a Viking drinking bowl. It is an outstanding example of medieval art. most powerful monastery in the North. 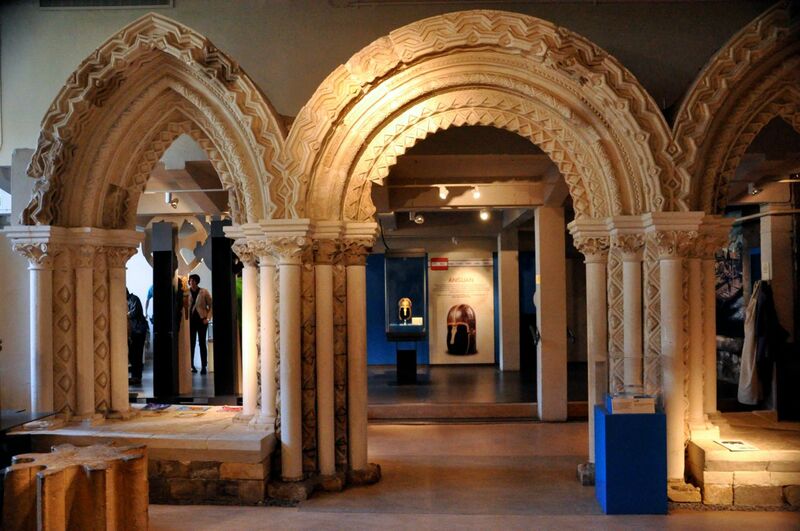 The interior of the Norman abbey was richly decorated for the time (pictures below). What survives of the decoration are just a few painted fragments that were discovered in the mid-twentieth century. 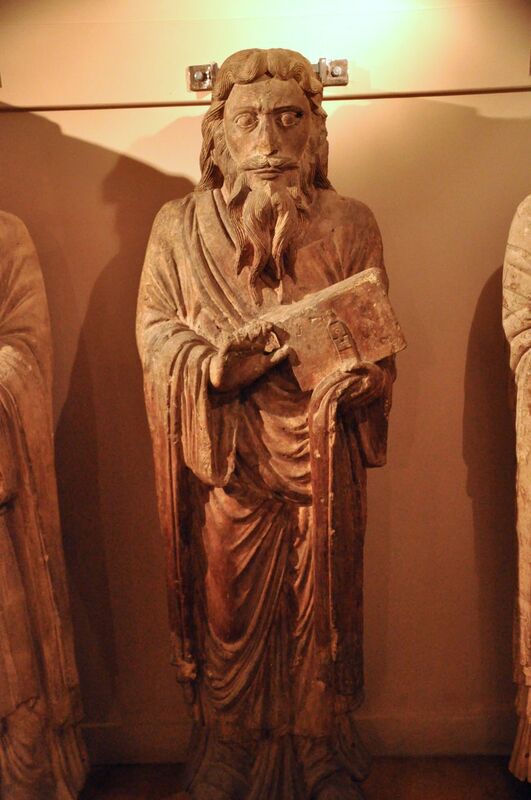 The larger-than-life statue to the left is one of 4 that adorned the abbey entrance to awe and inspire visitors. The statues were originally painted in a rich palette, and are the finest surviving examples of 11th century sculpture in England. It was dug up after being buried in mud for more than 3 centuries. The museum had a (much-restored) section of a wall from the Abbey’s Chapter house, shown above. Better, however, is what is on exhibit just outside the museum – the remains of St Mary’s Abbey itself. The Abbey met its demise during Henry VIII’s “Dissolution of the Monasteries” in 1540. These ruins (and so many others like it throughout England), stand as beautiful and stark reminders both of man’s artistry and accomplishments and man’s struggles with power and ambition. drawing. The high ceilings and large windows were there to circulate fresh air, important since illness in the middle ages was thought to be caused by ‘bad air’. The hospital cared for the sick, poor, and old; care included cleaning, feeding, clothing and housing. The sick were not treated for any illness until they had confessed their sins and thus cleansed their soul. The hospital was closed during the Dissolution, and York would not have any hospital for the next 200 years (!). Empire into Scotland). Choosing the winning side when potential heirs were battling for the throne was a tricky business, and York chose poorly in the case of Henry IV vs. his cousin Richard II (1400). Henry ultimately killed Richard, and wealthy York, which had raised an army in defense of King Richard II, suffered greatly. It took nearly a hundred years to recover. At the end of the War of the Roses, with Richard III on the throne (1483), York once again was favored. In medieval times, the badges of powerful people were worn by their followers (choose well!) and the museum had a number of these. 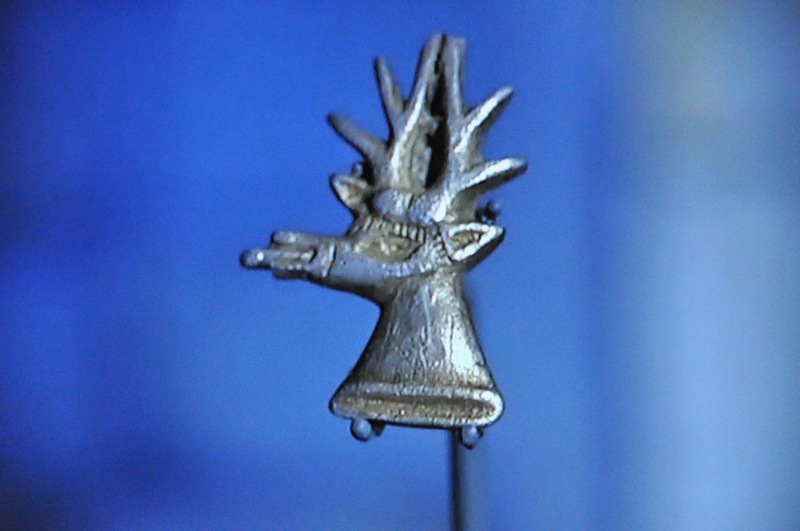 The white boar was the symbol of Richard III, and for his coronation 8000 badges were printed (most in cloth). Metal badges were reserved for supporters of higher status, and precious metal badges for the VIP’s. These were all represented in the museum. plaque, found at Wistow. With few bridges, river crossings were hazardous, so the Saint’s aid was often invoked. Among the displayed jewelry was the Middleham Jewel, considered to be England’s finest piece of medieval gold-working. Finally, the museum covers the Tudor period, from 1485, with just a few items. Wow, are these two museums different! 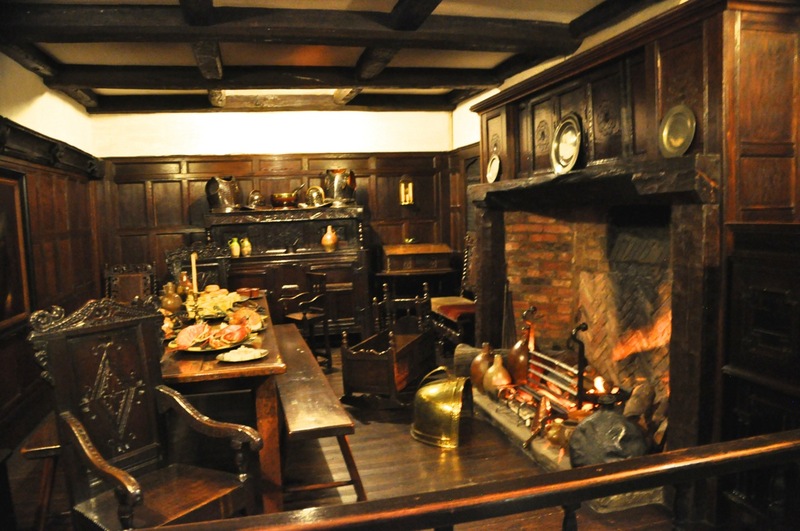 The Castle museum immerses you primarily in Victorian times – with a few exceptions, the first being this reconstructed dining room of a prosperous, late 1600’s family from the York area. The family no longer ate with the servants in a communal hall. Everything was made of oak, from the wall paneling to the decoratively carved furniture. The room would have been much lighter and brighter when new, without the patina of age and soot. 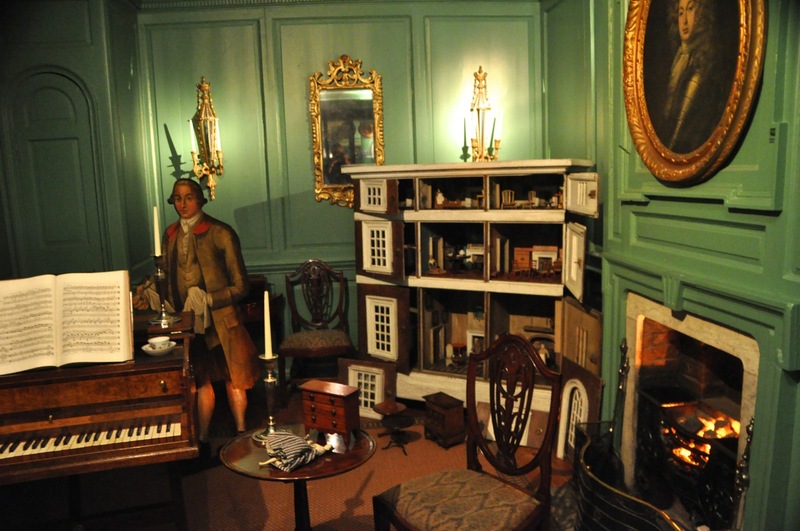 The second, the Georgian Room (about 1780), would have been found in a fashionable city home. The room is lined with painted pine paneling. The chairs and ceramics are typical of the period. With growing industry, items like the carpet, previously a luxury, are now affordable to a larger number of people. 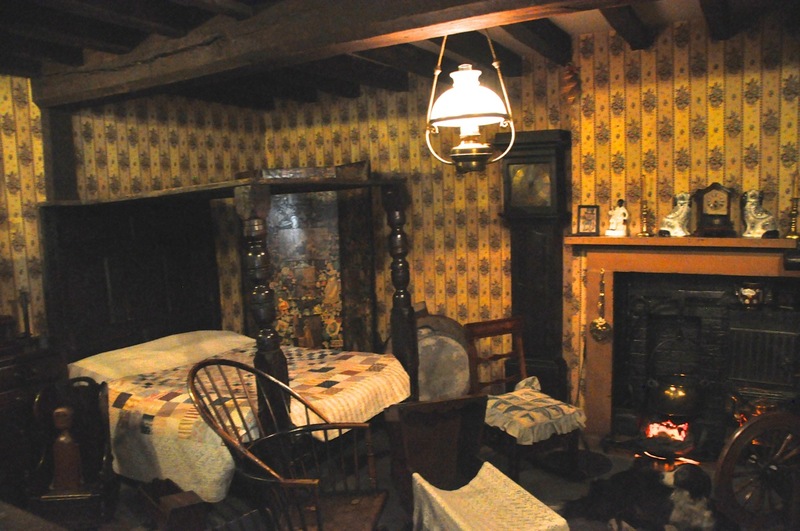 The Moorland Cottage, from about 1850, depicts a small rural house in Yorkshire (the rest of the building would house livestock). The peat-burning fire was the center of family activity and was used for heating, cooking, and providing hot water. The furnishings are practical rather than decorative, and often home-made. Furniture like the bed would be passed down over generations. 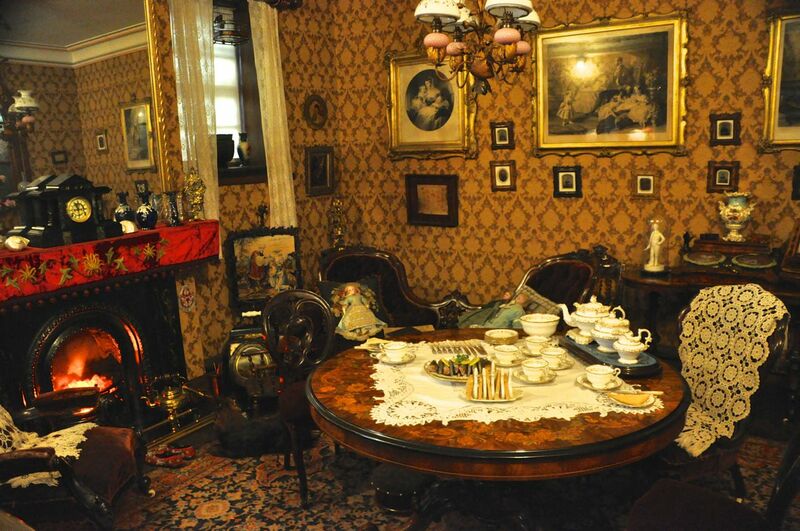 The Victorian Parlour, about 1870, depicts the “best” room in the house of a middle-class family living in the York suburbs. The room reflects comfort and prosperity. Most of the furnishings were, by then, mass-produced, relatively cheap and widely available. mourning apparel – first and second mourning, ordinary mourning, and half mourning. By the end (half mourning), grey, white and shades of purple were allowed. Different types of jewelry were to be worn at certain stages. Men, of course, were hardly affected, except for jewelry. Women’s (and some men’s) wedding clothes through the years were also quite interesting – wedding dresses have not always been white! supported the weight of heavy cauldrons, frying pans, bakestones or kettles, swung outwards from the fire to make it easy to lift pots on and off, and had an adjustable lever to help raise or lower the cooking vessel above the fire. Examples of other kitchens are shown below: note the improvement between the last two kitchens, both operating at nearly the same time! All of this history shows that life today, at least in some areas, is indeed a lot easier and nicer than yesteryear! bike. There was a bunch more to see in this museum, but you can’t see it all, can you? Hope you enjoyed this long look at the museums. 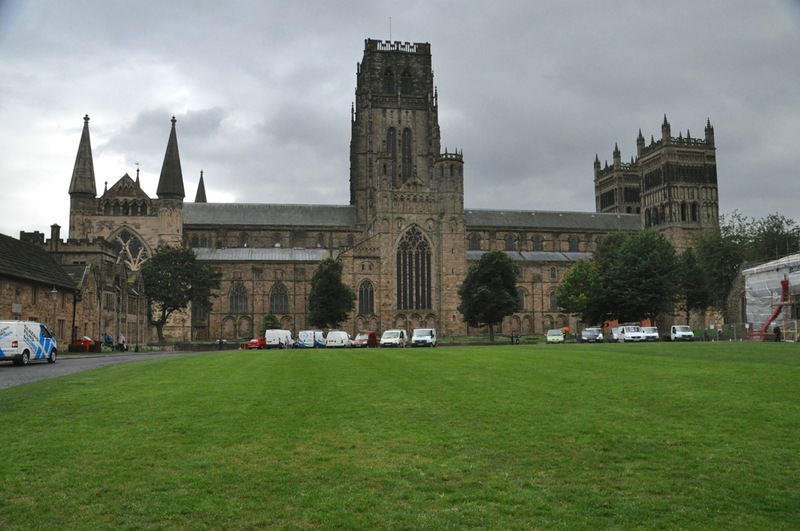 Next stop – Durham and its magnificent Norman cathedral. Heading toward Scotland! The previous post described York’s history and the building of this Minster, finished in the 1400’s (York’s History and the building of the The York Minster, January 20, 2015). Here we get to see it! 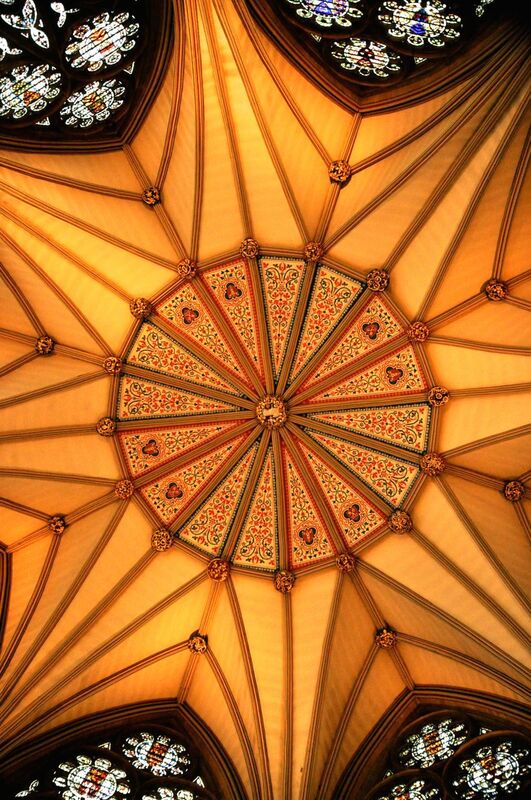 I’ll set the stage for the beautiful York Minster by showing you this fabulous ceiling from its Chapter House. If I could’ve included more of the windows in the photograph, you’d be even more impressed! I’m lying on my back in the middle of the floor to get this shot; I probably could have lain there mesmerized for hours, but I was afraid of being stomped on by people who were also looking up at the ceiling, not down at me on the floor. Spectacular, isn’t it? Now, with that appetizer, on to the Minster! 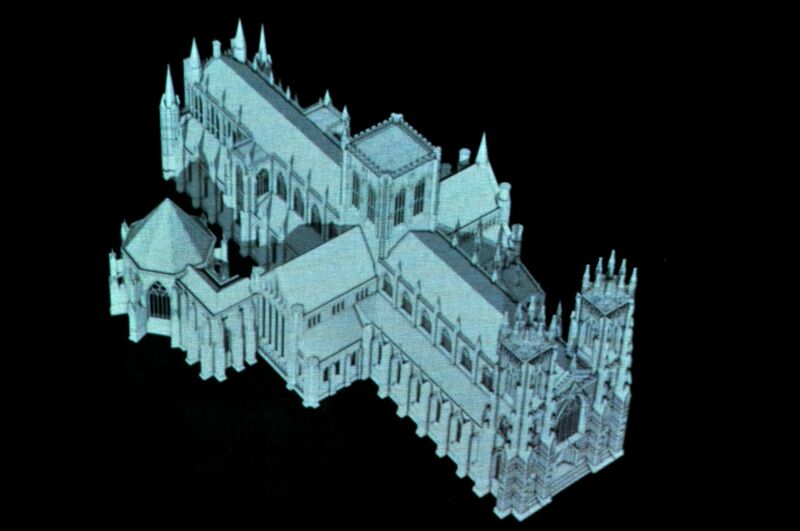 Instead of a photograph, I’ll have to show you a schematic of the Minster, shown to the right. It’s hard to capture the beauty of this cathedral because (1) it’s huge (it’s one of the largest in Northern Europe), and (2) it’s nestled in the heart of the city and you can’t back up far enough to capture it all. Hopefully seeing some of its parts will give you a reasonable idea of how magnificent it truly is. And of course I must include some of the gargoyles! A sculptor obviously has to have some fun, after all. The interior is impressively enormous, and beautiful. with a pointy roof. Nice on the outside, but the inside is better (below). Like many chapter houses, there are places for all the priests to sit along the walls; note that the sculptors had a good time with the figures above the seats! The last picture shows a model of the superstructure built to support the ceiling. This is 1280, remember! The central post (king post) is constructed from 3 huge oak trees spliced together …. For perspective there is a human figure at the center. And then there are the marvelous (and numerous!) stained glass windows. That last window, the West Window, is from 1338! Its heart-shaped tracery is called “The Heart of Yorkshire”. Note in some of the pictures above that it is difficult to discern the images. Over the centuries the windows have shifted and buckled and the glass has cracked and been repaired so many times that there is as much lead as glass. 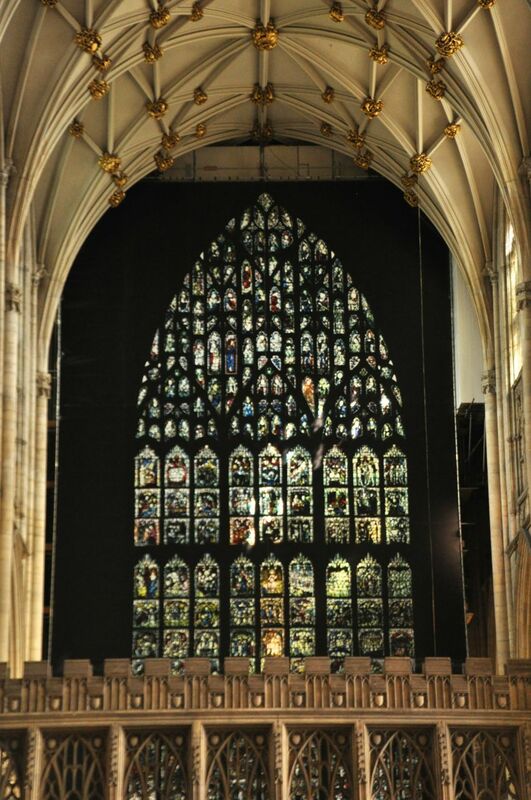 To address this, the church is carefully (and at significant expense) restoring the windows, starting with the Great East Window of 1408, shown on the left. This window depicts the beginning and end of the world, and is the largest existing expanse of medieval stained glass in the world. Happily, a few of the repaired window panes were on display. The first one, below, is from Revelation 16:3 – “The second angel poured his bowl into the sea, and it became like the blood of a corpse, and every living thing in the sea died“. The repaired panes are pretty spectacular. Well, enough for now. The next York post will show you some cool stuff from a couple of museums, and then we’re off to Durham, site of England’s greatest Norman church, and Hadrian’s Wall. Perhaps you’ve surmised from our northern trajectory that our main goal here is bonny Scotland, which we’ll explore in some depth.